It's easy to become confused when confronting all of the simultaneous trends in the world of cloud computing and Cloud Foundry. But persist we must. 1,500+ people gathered last week during the Cloud Foundry Summit 2017 in Santa Clara, Silicon Valley, to discuss PaaS and digital transformation. Several thousands had gathered the week before in New York City to attend Cloud Expo and discuss cloud computing and all that it entails. I attended both events, and am now confused. Maybe “overloaded” is a better word. The two events provided a veritable hashtag festival for anyone interested in Enterprise IT. On the programs and in conversations, it’s clear we’ve now gone beyond the basics of #Cloud, #BigData, #IoT, and #DevOps to embrace #CloudEnablement and #CloudNative, then onto #Blockchain, as well as the #AI, #ML, and #DL #cognitive quartet. Add to this the ubiquitous need for mobile apps and access, as well as emerging concepts, such as #GameTheory and #TokenEconomy, and we’re faced with a cognitive inundation, if not dissonance. Thus, my confusion. Oh, and let’s not forget the #FinTech #InsurTech revolution. These hashtags are not simply buzzwords. There are companies large and small that are now seriously integrating one, several, or all of the technologies that reside behind these hashtags into what they do. Initial waves of disruptors have agitated the Global 2000 into a Revenge of the Sith scenario in which the disrupted now wish to disrupt the disruptors. Add to this complexity the reality that Enterprise IT presents a welter of generations of legacy technology, virtualized resources, and workloads, some of which are now moving into several varieties of cloud infrastructure. Despite countless product strategies and products themselves that promise to automate this, simplify that, and remove such and such headaches from your life, complexity only seems to be increasing. 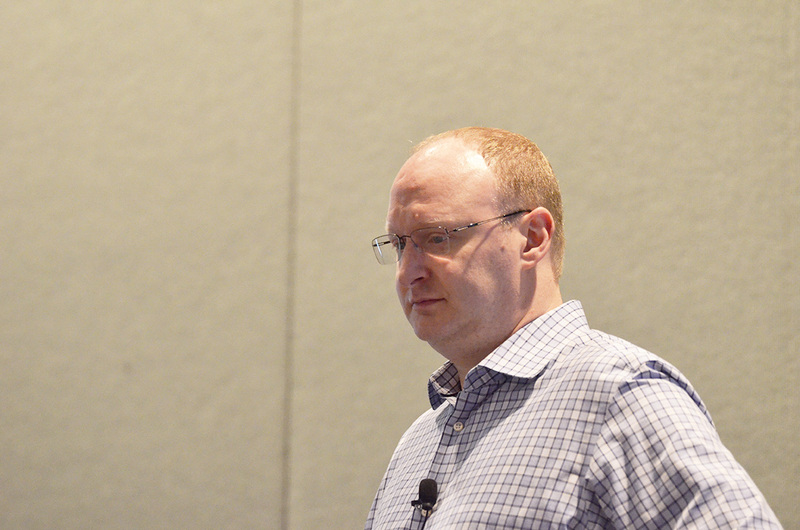 Gatherings such as Cloud Expo and the Cloud Foundry Summit exist to allow a full airing of grievances and promises. How many applications (or services) does a large enterprise use? 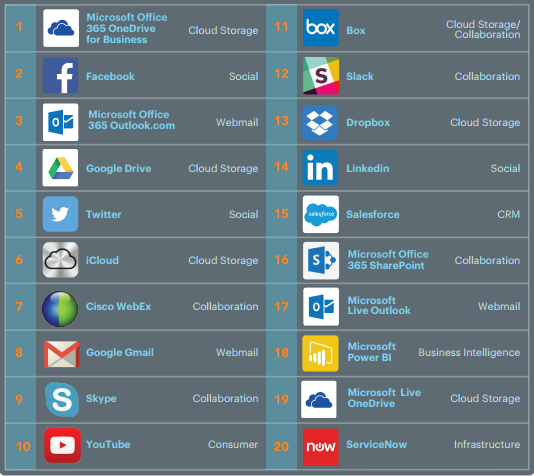 The short answer is “hundreds, maybe more.” A longer answer would point out that most Global 2000 companies have a familiar Top 10, including Microsoft Office 365, Salesforce, Google Drive, Box, Dropbox, WebEx, Slack, and several social-media platforms. There’s much more, for example, the 3,000 enterprise app vendors being tracked by a website that’s focused on them. Countless others develop custom software for enterprises, often in conjunction with their customers, to span the range of productivity collaboration tools, logistics, marketing analysis, and engineering—accompanied by widely varying complexity in the customer-facing part of its website. Still, despite our surface knowledge of this complexity, it’s difficult to learn a lot about what’s going on inside all of these enterprises. For example, even the best-developed events will feature from several to a dozen strong case studies, offering insights into a very small section of the overall activity among the thousands of large enterprises in the world. How then, can higher level decision-makers begin to grapple with an overall strategy and vision for digital transformation? What sort of time frame is realistic to plan, build, and deploy a complete transformation? A few weeks? 12 to 18 months? Several years? One thing I took while listening to people these past two weeks was that the days of experimentation are nearing an end. Technology buyers and sellers alike wish to move beyond POCs and MVPs, to think long and deeply about getting an entire enterprise IT infrastructure onto a platform and into the clouds. This wish relates to the so-called 80/20 rule (based on the Pareto Principle), which says that 80% of IT is devoted to operations with only 20% devoted to innovation. A few years ago, I heard conversations about moving the needle on that ratio in the direction of innovation. Then, more recently, we witnessed the idea of “bi-modal” enterprise IT, in which cloud and other cool stuff is used for new apps and innovation, and the towel is thrown in on doing anything with the stodgy old legacy stuff. Just let it fade away. However, organizations have realized that their legacy data is their prized asset. They need to get it out of its stovepipes and into an infrastructure that’s flexible and interoperable. It’s time to eliminate the daily FUBAR that all IT professionals will gladly talk about if they know they’re not being quoted. I found this marvelous quote online from Scott Ambler of AgileData.org: “Working with legacy data is a difficult task, one that I don’t wish on anyone. Unfortunately we all have to do it.” Yes, it’s going to hurt and it’s not going to end soon. And so the long journey to digital transformation has officially begun. 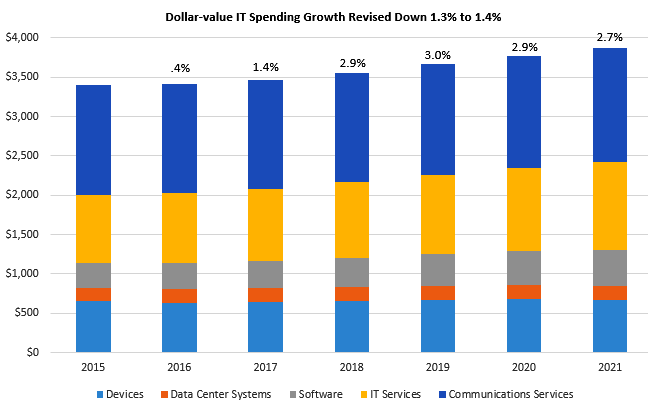 The total worldwide enterprise IT budget is about US$2 trillion (not including telco), according to the Gartner research. Of these, 64% is spent on software and services, 29% on PCs and devices, and 8% on big iron. An average Global 2000 enterprise devotes 4.4% of its revenue to IT, according to a figure I derived from a variety of sources, including TechVera. Calculating from these figures, a median G2000 (or Fortune 500) company spends $300 million on software and services. On a larger scale, a Global 200 (or Fortune 50) company spends an average of $2.5 billion software and services. On a separate plane, the amount of data handled by business enterprises now measures in the several zettabytes (several million petabytes) per year, and is growing at around 26% annually. Following the Rule of 72, the amount of new data being created continues to double in less than three years’ time. How are organizations handling all this data? The term heard most on both show floors was “multi-cloud,” in contrast to last year’s debates on hybrid cloud and the early-days discussions of the SaaS/PaaS/IaaS trinity. Lest you get tired of reading and hearing about what can appear to be mere wordplay, I urge all to be resolute. The distinction between “hybrid cloud” and “multi-cloud” seems to be that in the latter case a company may pick more than one public-cloud provider, while the former case was used to describe a combination of on-site cloud (or perhaps just virtualization) with the services of a public provider. But really, who cares? The good news is that technology vendors seem eager to offer whatever combination of cloud services are needed for a particular project, and now it’s time to cut into all of that pesky legacy technology and migrate it. On the large scale, a global cloud-based digital transformation will vastly increase utilization of processing resources, and—therefore—efficiency. Total electricity demand growth should slow. This is critical for the developing world, in which per-person electricity consumption runs only 3–5% of the developed world. Systems will become more responsive, organizations more agile. This latter term is thrown around with impunity by technology providers, but I think it’s valid. It means what it says, so just as agility—and the speed that usually comes with it—lets superior athletes accomplish remarkable things, an analogous organizational agility should let companies be faster to market, more flexible in adapting to changes, quicker in addressing customer issues, and more responsive to the gestalt of business overall. Despite many compelling talks about the benefits of the specific technology adoption methods, no single architectural approach can be applied to all issues. To list an example, the serverless model looks ideal for smallish, event-driven apps, such as collecting real-time data from an array of sensors in an IoT deployment. But it’s not the path to the enterprise-wide change, at least not now. 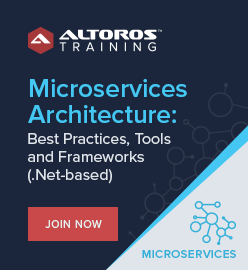 In similar fashion, microservices offer a new flexibility for apps new and old, but must be deployed purposefully from the beginning. Then, we have the vast panoply of development and scripting languages, which collectively embrace most imaginable scenarios, but it must be clear when Java or Ruby is needed, when Node.js might be ideal, when to go with Go, etc. The hashtags will continue to evolve and multiply, apps and services will continue to proliferate, and there will assuredly be more than a single cloud in most enterprises. A counter-argument could be made here about going “all in” on a public platform. However, even in such cases, I suspect that some of these companies’ IT lies outside of the all in. The promise of digital transformation carries with it the idea of a distributed, sprawling IT environment that nevertheless provides ease of access, great reflexes, and the ability to get smarter on its own. There now seems to be enough momentum with clouds in all of their forms to start addressing the core of the enterprise. Still, somewhere, somehow, a unifying platform must be present if the later 21st-century enterprise is going to be less of a spaghetti factory than what we’ve wrought over the past five decades. In that spirit, a current passive-aggressive battle is being waged between Cloud Foundry and Kubernetes, as their respective maturity levels contrast with some crossover in their respective abilities. The new Kubo initiative aims to get everyone reading from the same book, if not the same page. Certainly, it was viewed positively by the Cloud Foundry community to see the creator of Kubernetes, Google, as a major exhibitor at this year’s summit. Microsoft was there, as well. Both companies are now Gold members of the Cloud Foundry Foundation itself. Yet, this may end up being a barroom brawl after all, because the platform and navigation of workloads is the cornerstone, the linchpin, the wheelhouse, the center of gravity, and the essence of building IT infrastructure in these times. As this scene unfolds, no one is unaware that Amazon continues to be the leading public-cloud provider, and also staked a claim to the more recent serverless approach some time ago. Oh wait, the entire digital transformation discussion cannot be had without mentioning DevOps…but next time.